We all drink tea. Some of us drink it every day and some just when they are sick. But you drink it. Admit it! Is there anything more relaxing then a warm cup of some fruity tea? Of course not. And it is really healthy! So, all you need now is the cutest tea infuser ever – Birdie Swing. Wonderful bright colors (purple or lime) are just great and this cute bird is a perfect help for some old-school brewing. It’s so simple to use. 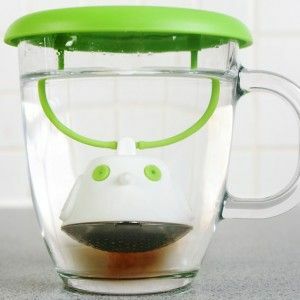 Just fill the infuser with some loose tea and place it on a cup of hot water. Once your tea is brewed, just turn the lid over to use as a dip-tray. And that is it! You can now enjoy in your perfect cup of tea. Price is Â£ 9.99 and if you like it, you can check it out on Firebox. You will get infuser, lid and drip-tray, but glass mug is not included.